Vehicle wraps are one of the most effective forms of physical advertising around. At The Sign Brothers, we can help you design a stunning wrap to turn your vehicle into a mobile advertisement. According to the Advertising Association of America, vehicle wraps can generate 30,000 – 70,000 impressions a day depending on where and how much a car is driven. The average car wrap lasts around 7 years. Imagine how many impressions one wrap could make? Our staff has the design, production, and installation experience to handle your fleet projects, no matter how large or small. From a single truck to a fleet of 30 vans, we can handle your project quickly & professionally. Our production department utilizes multiple wide-format printers, so we can produce your graphics faster than ever. 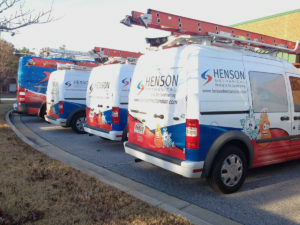 We have multiple installers on staff, which means your vehicle graphics get installed quickly. This minimizes vehicle “down time,” and your vehicle is back on the road doing what it should be: serving your business. Your trucks aren’t useful when they’re in the shop. We’ll get them back on the road fast & have them looking better than ever. We can design your vehicle graphics to meet any budget, from a bumper-to-bumper marketing machine to simply providing your company’s contact information on the sides and rear of your vehicle. Our project managers are responsive to your needs. If your organization has a lot of vehicles on the road, then there are a lot of eyes on you every day. Your vehicles are making thousands of impressions on your customers & prospects every day. Make sure your fleet is making a good impression by having it properly branded with our custom graphics. There’s no more cost effective advertising you can undertake than putting your message where it can be seen more times in a day for no recurring costs.